A few weeks ago I gave a presentation to the Florida Municipal Electric Association, that I reworked here to make it a bit broader and applicable for the majority of cases in the United States. It is primarily about small cells and considerations that private landowners/exempt public landowners should have when considering small cell leases. Prior to State Small Cell Legislation, it was a bit of the wild west. Wireless service providers or their infrastructure companies were trying to claim that they were utilities, with some going so far as erecting poles overnight without permits. 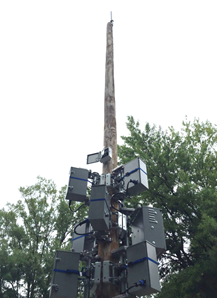 Municipalities and counties were all over the board in their approaches to small cells. You can find the entire slideshow here. To get a taste of the presentation see the short video and comments below. The industry pushed small cell state legislation by making ridiculous and misleading claims like this- that small cells are the size of a “pizza box” all while pushing legislation that allowed them to put 6 cubic feet of equipment on the top of the pole and 28 cubic feet at the base. That’s a lot of pizza boxes. This graphic shows what happens when multiple companies each seek to deploy their own poles at 200’ apart. While the wireless companies try to paint a very pretty picture of the distance that their small cells can cover, they very carefully omit to share that small cells (especially fixed wireless) are sensitive to line of sight issues and other degradation of signal from foliage and buildings and even weather. To resolve these issues, they overbuild the numbers of sites to address these issues and capacity issues as well. To see our upper-level recommendations regarding evaluating small cell leasing for public utilities and coops in the wake of state small cell legislation please see the presentation in its entirety. If you are interested in learning more about these and other recommendations, please don’t hesitate to contact us. Opinion: Stories of small cell application agreements failure between carriers and cities are too often part of the wireless lobby efforts (in the media) to maintain profit margins. This type of fluff pieces provide no actual statistical data on how most cities treat applications for small cells instead relies upon anecdotal examples from isolated cities. There is no statistical information about how many municipalities “are acting as if they’re 100-foot towers”. No study or other reference proving this oft-stated dictum from the carriers and their lobbyists. Where the author chooses to cite an actual city with high lease rates for small cells, he fails to acknowledge that the cited lease rates for Newport Beach are historic data from old DAS agreements. Furthermore, he ignores that the wireless providers in CA still have the right to utilize Joint Pole Authority poles from utilities at lower rates. This type of piece suggests that the municipalities alone are restricting the deployment of 5G- and fails to acknowledge that there are actual utility poles available to the wireless carriers that are available at federally prescribed rate schedules. This article also ignores the fact that many times the wireless carriers prefer to install new poles in the ROW because it is cheaper for them not to have to do a structural analysis on an existing pole despite the added impact on residents aesthetically and to the city from a public safety and operational standpoint. 5G isn’t imperiled because of municipalities- its imperiled by wireless carriers desire to maintain 40-50% margins and their concern that such margins may erode without public welfare. It is imperiled by the unwillingness of utilities like the very companies asking for relief to share their poles- either existing ones or new ones. I don’t doubt there are difficult municipalities and those that may be overreaching- but using unsupported platitudes to justify a fluff opinion piece like this is a disservice to the discussion. But then again, that seems to be the wireless industries playbook. Point to the bad actors without providing any substantive data on how many good actors there are. Is This a Small Cell or Just a Small Macrocell? What appears to be a macrocell attached to a utility pole. 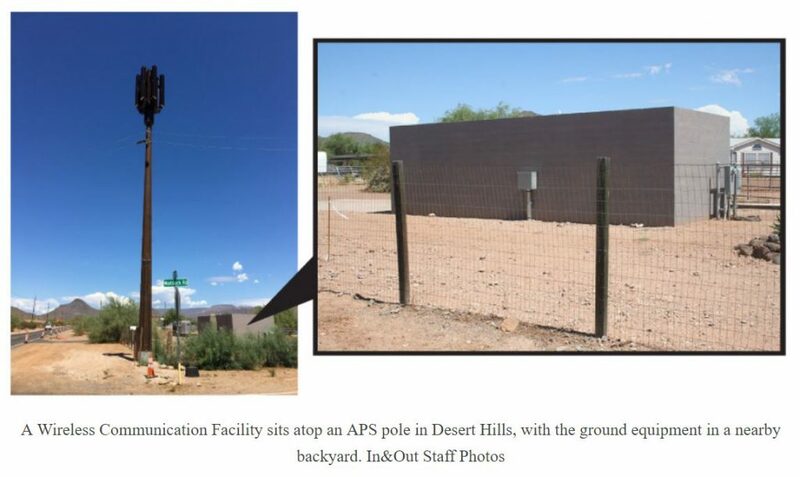 So in this article about Verizon attachments to Arizona Power (APS) utility poles in the Phoenix market, it is interesting to see how Verizon is installing a 6-panel array on top of utility poles. Also interesting is that Verizon is leasing ground space adjacent to the pole from the nearby landowner for their equipment space. Given the size of the equipment space, it appears that this is a macrocell. However, the APS representative states that this is being treated as a pole attachment under the FCC pole attachment rate schedule. I am surprised that APS allowed this large of an installation to be placed on the pole for the nominal FCC pole attachment rate. It is hard to tell whether the antennas would fit within a 6' cubic space that is allocated within the Arizona small cell law for antennas. There is a better photo of the equipment and pole inside the article. The City of Phoenix is pretty favorable to pole attachments in general, so whether it meets the 6 cubic feet of space limitation or not may be immaterial. However, in other jurisdictions, this installation may not be approved administratively under the state law. 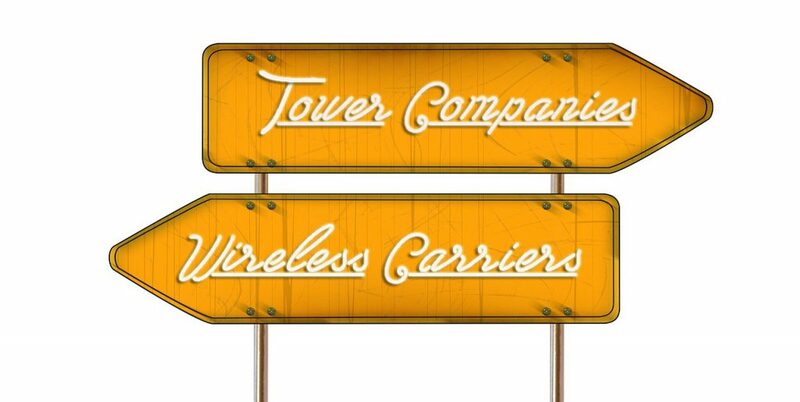 Tower companies this way- wireless carriers this way. The Wireless Infrastructure Show is the pre-eminent tower show in the US. The WIA who puts on the show consists of both tower companies and wireless carriers although it has mostly been run by the tower companies. The Show is a great show to get a chance to talk to and hear from people in the field building and operating towers and small cells. Here are the themes that we found most intriguing at the show. The dichotomy between what we heard at the show public events and what we heard directly from tower companies during the meeting is greater than we can remember. 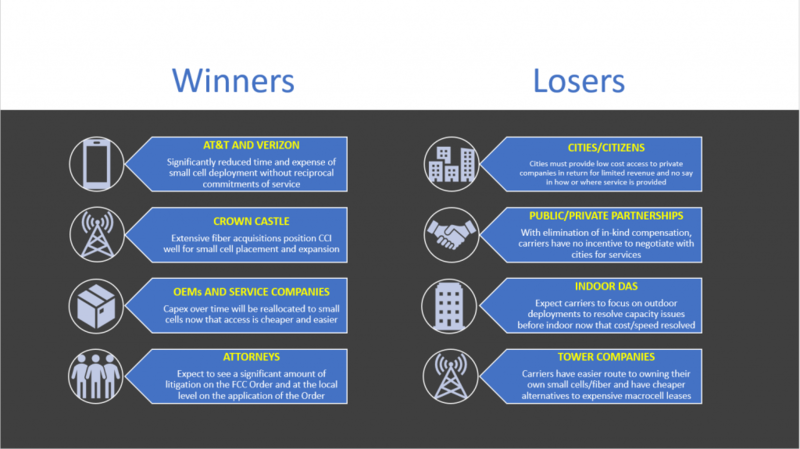 Whether related to how small cells fit in, the focus of municipal legislation, or how small and mid-size tower companies are now fulfilling the role that public tower companies did previously for wireless carriers, there is a growing divide between what were previously cohesive goals. 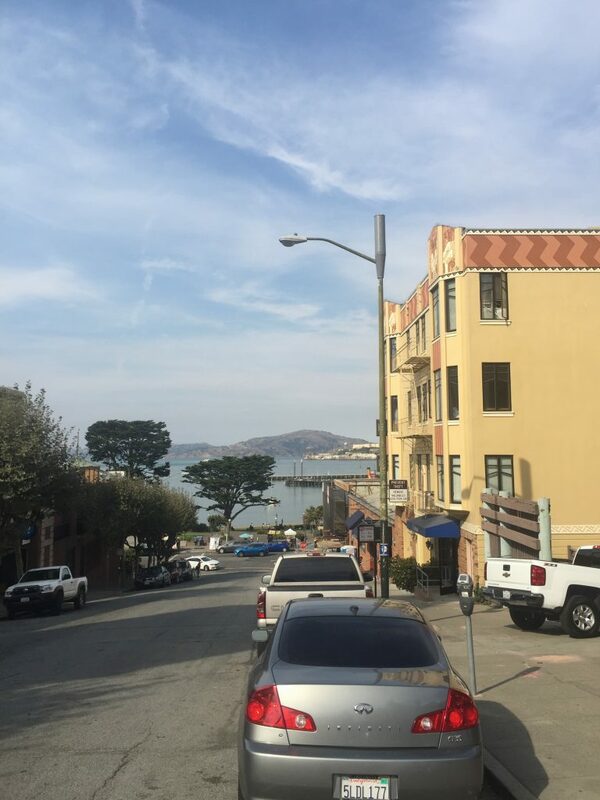 While the WIA is supposedly an organization that works for both carriers and tower companies, the dissention between the two is most apparent in the interest both groups have in small cell infrastructure. The tower companies are quick (too quick in my opinion) to proclaim that no macro tower has ever been replaced by small cells all while intentionally failing to acknowledge the displaced Capex budgets for small cells and the declining collocation lease-up for new macrocells. The carriers secretly (or not so secretly) are pushing for small cell legislation that doesn't afford the same protections to public tower companies (or DAS companies) as it does to wireless carriers. As a result, the tower companies now have lobbyists and possibly PACs of their own to push for their own objectives but nowhere near as many lobbyists as AT&T and Verizon have retained. 3. There Are Signs of Tower Crew Shortage Already. We asked this question over and over and received mixed responses. Some smaller tower companies (presumably those with long term relationships with vendors) indicated that they weren't having any issues. However, we heard from more than one contact that there were notable shortages especially on larger jobs. Considering that nominal repacking from the broadcast incentive auction has commenced and that AT&T hasn't yet released the flood gates of FirstNet activity, we will be watching this trend closely to determine how it impacts revenue expectations by the public tower companies and deployment activity by the wireless carriers. After closely examining the location of tower company towers in each of the 10 phases of repacking for a hedge fund client which tend to be backloaded over the next 3-year period, we suspect that the crew shortage will get worse. 4. The Impact (if not the number of towers actually relocated) of "Rip-n-replace" is Greater Than Expected. Unsurprisingly, this really wasn't discussed at the public level at all- but 8 out of 10 of our private conversations dealt with the possibility that private tower companies are building new towers near existing towers to accommodate one or more wireless carriers relocating from the existing tower to reduce their rent. While we aren't seeing evidence of a substantive number of actual relocations as of yet, we have received an increasing number of inquiries from landowners who have been approached by one of the eight or so private tower companies who are reputed to be actively engaged in relocation efforts. More importantly, for the first time, we heard specific and actionable efforts by the public tower companies to counter the possible threat, which tends to suggest that they are more concerned about the threat than they publicly acknowledge. 5. The Tower Industry is Optimistic About Modification Activity, but Pessimistic Regarding New Lease-Up Activity. At least as it pertains to our checks, the tower industry seems outright gleeful about the increase in modification activity expected in the coming years. Between FirstNet, the Incentive Auction, and TMUS activity, towers should see nice revenue growth from modification activity in the next 2-3 years. Left unsaid (or in some cases directly said) was the low expectations of collocation lease-up activity in the coming future. While FirstNet may result in some limited number of new collocations, it won't be material. Some of our tower company clients indicated that they have been seeing low lease-up while others are seeing more positive lease-up. There does appear to be a correlation between higher lease-up and to the urban/suburban/rural location of the towers. If you are looking for details on which tower companies have the most urban/suburban/rural towers and which tower companies have the fewest competing structures per tower amongst the tower companies, we recently completed an in-depth statistical analysis on this for a hedge fund client. Contact us for more details.